Pagliacci Pizza has a long relationship with Seattle stomachs that dates all the way back to the first slices served up in the U-District in 1979. 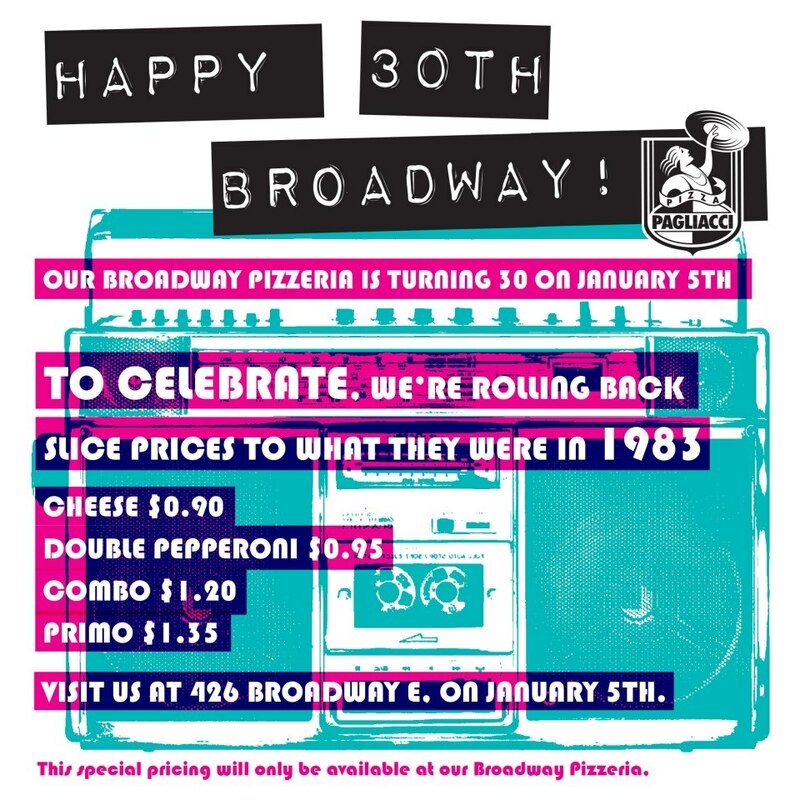 Four years later, Pagliacci opened up at 426 Broadway E. Saturday, the chain that dominates Seattle’s pizza delivery scene will celebrate 30 years on Broadway by rolling back prices to 1983. Pagliacci’s connection to Capitol Hill runs even more deeply than its shop’s long duration on Broadway. The company’s E Pike facility is the brain center and brawn for the chain serving as the operations headquarters and the Pagliacci call center. Those helpful Pagliacci order takers work alongside the company’s prep kitchens where items like salads are chopped and boxed up for distribution. The system works for both the delivery business and the 24 restaurants — 3 on the UW campus — the company has grown to — even as other fast food along Broadway has come and gone. Pagliacci’s current ownership, by the way, is predated by the Broadway shop after the chain changed hands back in 2000. On Saturday, you can pretend it’s 1983 again when people apparently lined up for a block or two to purchase 95-cent pepperoni pizza while wearing day-glow neon. Pagliacci Broadway serves its first slices at 11 AM and is open until midnight. Pagliacci on B-way killed the Rocket!! !